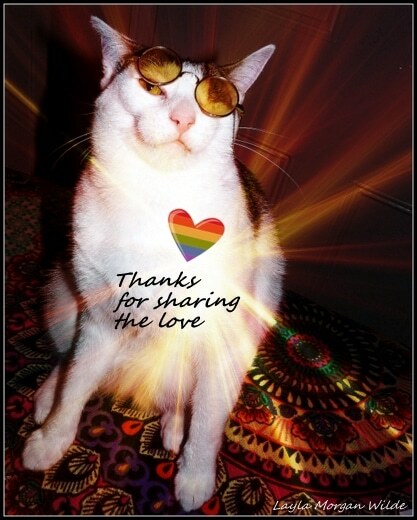 We love you for welcoming us into the cat blogging community with open arms and paws. We love you for supporting us online by “liking” us and subscribing. And most of all, we love you for loving cats! Cat Wisdom 101 is only six weeks old and receiving thousands of hits a week. That’s the power of love. We believe what goes around comes around. The more we love and share, the more we ALL receive. I don’t think taking a break of a few hours away from your blog actually counts as a break…. Congrats again on the Daily Show segment – you were fabulous, even if Odin stole the show…. LOL, about the break. And yes, Odin stole the show, and is now demanding his own show! Hi there! Jonesie said that you can copy/save as a copy of our Society of Feline Gardeners club badge. We don’t have html code…but if you like, let us know and we can email it to you for your sidebar. Happy to report I was able to stay up to watch the segment!! While it was a short bit, it was still funny and you must have had a blast working with Jackson! Loved seeing Odin on his harness and you chasing after him! Kudos to you for being on Comedy Central! Very cool indeed! Love Showers from Deb and her feline clan! Thanks, Deb, we had so much fun. They were there all afternoon. Well I’m certainly delighted y’all are here and I always enjoy your visits to my blog too! Enjoy your break, but remember, we’ll all be missing you! My break came and went. I’ll be back tomorrow. We enjoy hearing about all the kitties every day. Great fun. Glad everyone is coming to see you. Nothing better than the cat bloggers. Take care and have a great day. Sent you an email. I just saw the Daily show this morning ’cause I taped it last night as it was on so late here. I was happy to see you get some recognition, but the most noteworthy thing was the brevity. Made me wonder why they put it on at all, unless there was the small segment after the opening of the program and more came later. The truth of the matter is that John Daily turned me off and I didn’t care to watch it any further. You looked lovely, Layla, and I hope you and the cats get better coverage next time. Tinch, thanks. These segments are always short. You never know how they will spin it. I’ll be posting the whole segment here soon. All publicity is good publicity. No, you have to be yourself. And you are nice! Wow I didn’t realise you were newbies! Makes me feel very old and am also thinking I should take my blogging more seriously. Is the segment from the show online? Yes and no about newbies. 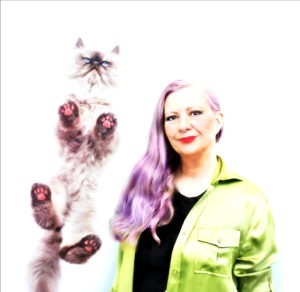 CatWisdom101 is, but I’ve blogged for three years (and still blog daily) at the Boomer muse. Every Saturday, I’d blog about my cat as Cat Saturday. The segment is online and I’ll add it here today. Have to tell you, love the colors in your home! You looked great! Congratulations from me and Sam on your six weeks of fun with the new site. Odin, you and your housemates (including your Mom of course) do a great job of informing and entertaining. I look forward to seeing the posts every day. Here’s to the future….hip hip hooray!